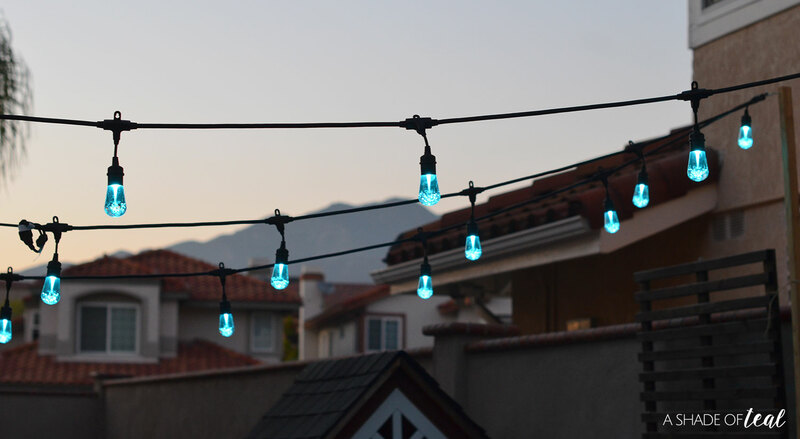 Have you ever wanted to spruce up your backyard patio with some lighting but you don’t have anywhere to hang the lights to? 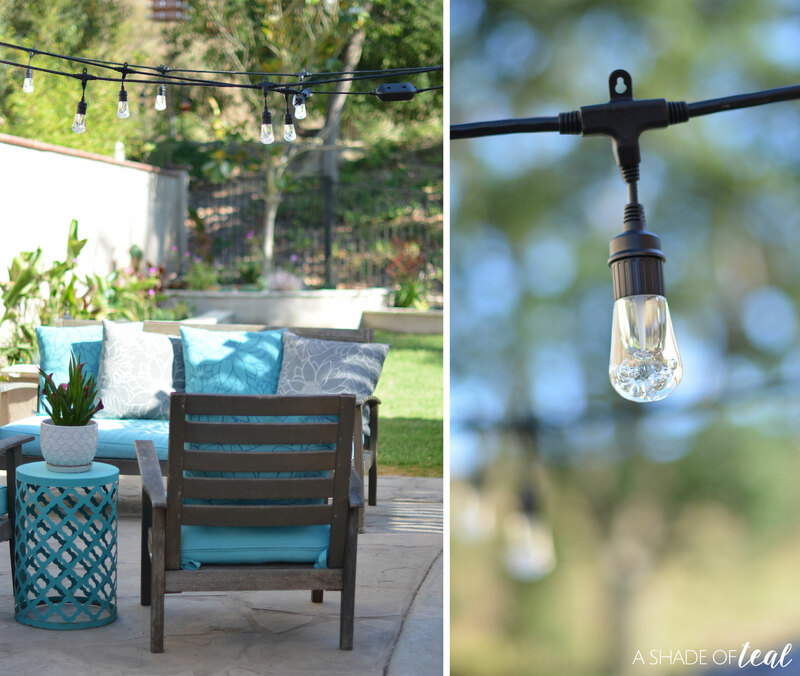 Then I have the perfect patio update for you! 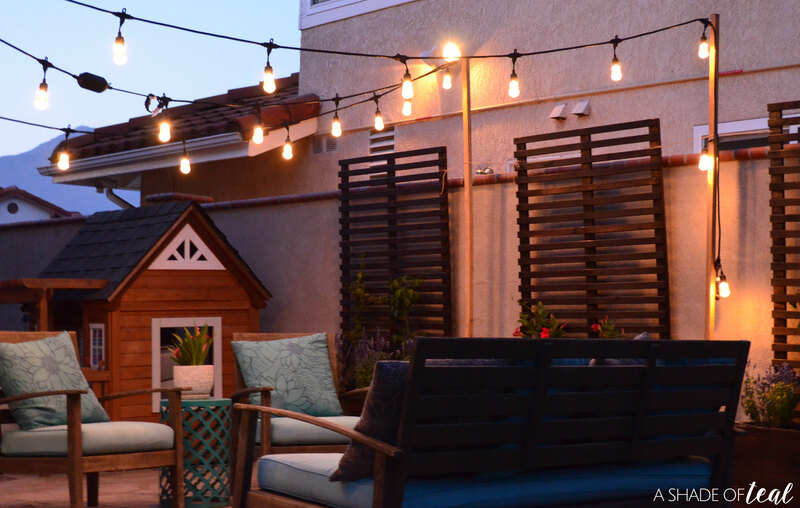 Learn how to add outdoor lighting anywhere with these custom posts. Large and heavy Ceramic pots. 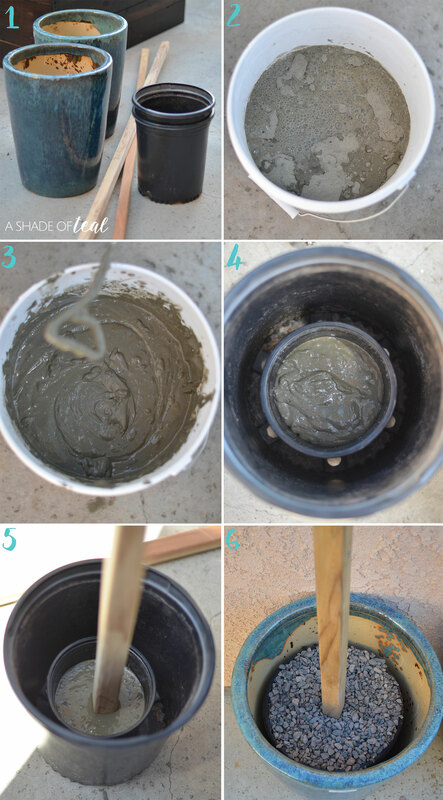 Step 2- Mix the cement by pouring it into a separate bucket with water. Step 3- Mix really well. Step 4- Pour the cement into a plastic pot. Step 5- Add the post and let dry. You will need to prop the post up against something till it sets. Step 6- once the cement is completely dry you can move into the ceramic pot and add extra gravel and rocks for added support. You can even add soil and plants once your all complete. Now make it all come together by screwing the hooks into the top of the post. I made 2 light posts and then added 2 screws to my existing patio structure. But if you don’t have a structure then you can make 4 or more light posts. Finally start hanging the lights and get ready to enjoy! 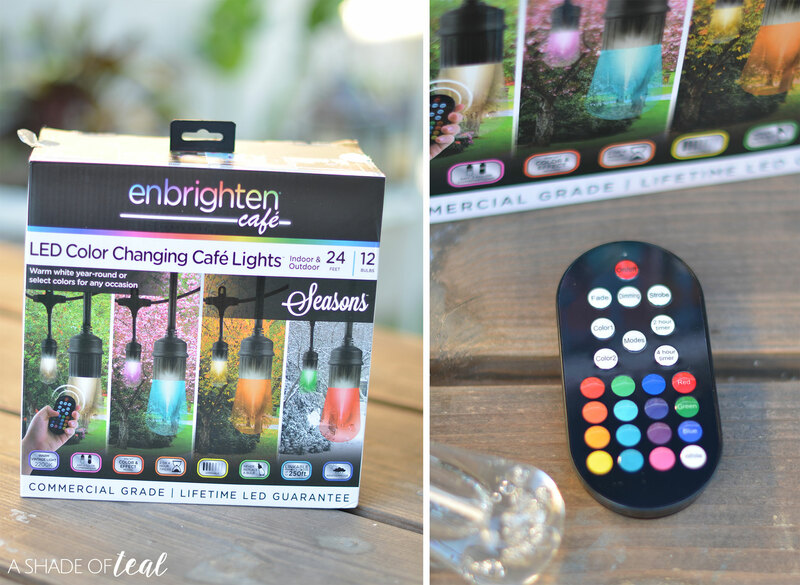 I used Jasco’s Enbrighten Seasons Color Changing Café Lights and I LOVE these lights! They have so many features that you’ll never get bored. For starters it comes with a built in timer, a remote where you have 16 colors to choose from, a dimming option, and it’s linkable up to 750 feet. You can find them here. I added them over my new patio space and created a sitting area underneath. During the day they create and distinguish the space, while at night they totally transform the space and add so much light. I know my daughters favorite part is all the color options. With the Enbrighten Seasons Color Changing Café Lights the options are endless including my daughters favorite, rainbow lights. Above are 3 options; rainbow, classic white, and pink. I think my favorite color is the teal option! These light posts were so easy to make and the new Jasco’s Enbrighten Color Changing Lights add the perfect color ambiance to the space. I can’t wait to enjoy summer evenings under them. Here’s a nighttime pic to give you a better idea how much light these Jasco’s Enbrighten Color Changing Lights put off. Click here for more inspiration and ideas for the Enbrighten Color Changing Café Lights. Now I’m off to enjoy my new backyard space! « Playhouse Update, How to add a Roof! 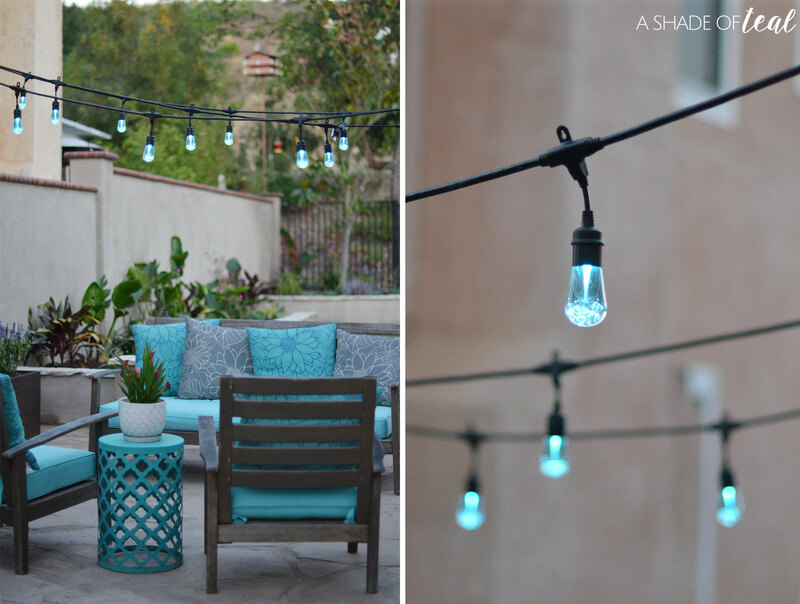 What a great idea to add lighting to your patio! I have been installing solar lights because my backyard is too dark! That’s such a great idea, and the lights look so good. I have been wanting to add lighting to my front porch but I don’t have an electric outlet outdoors. 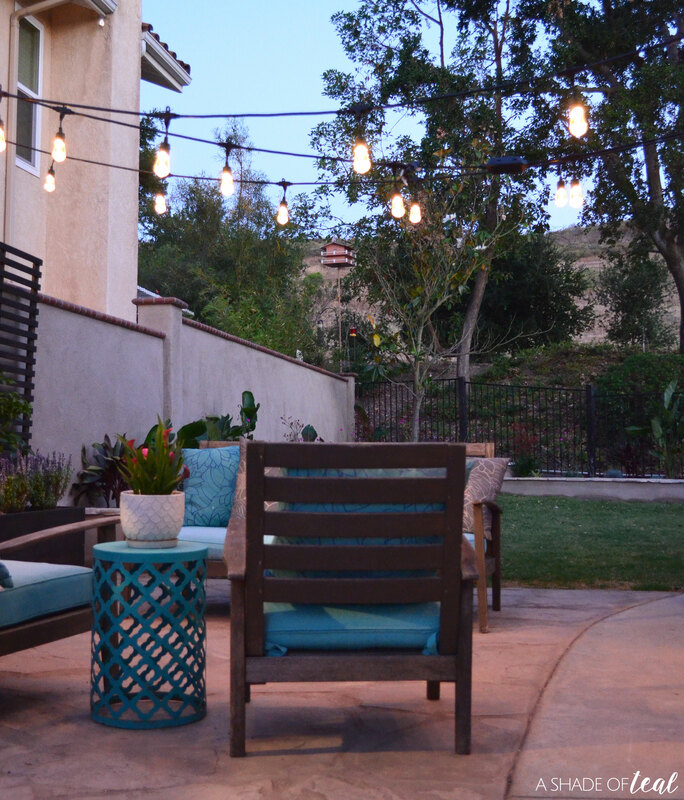 Your patio looks great with those lights! 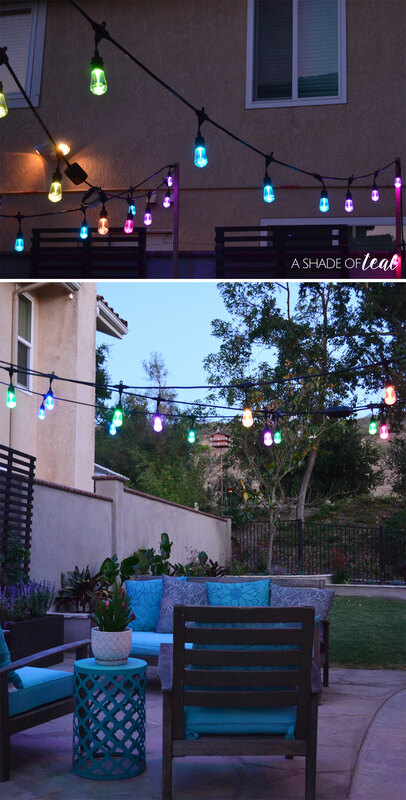 I would love to check these out for our backyard patio. I love everything about it! Now just let me know when I can come over. These are fabulous! 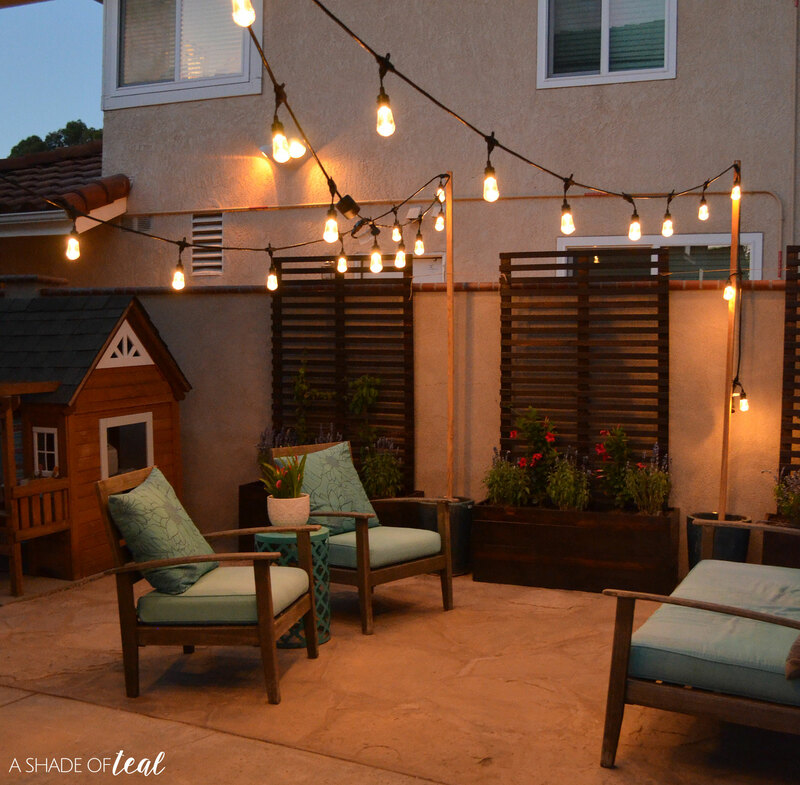 What a great way to make a backyard patio more cozy! I really want to try this! aws how beautiful is that! i wish i have a patio, i live in a city apartment now but my in laws would really enjoy this! happy weekend. Lighting is so important for every part of our living spaces. The patio is a great place to sit at night with friends and just relax. 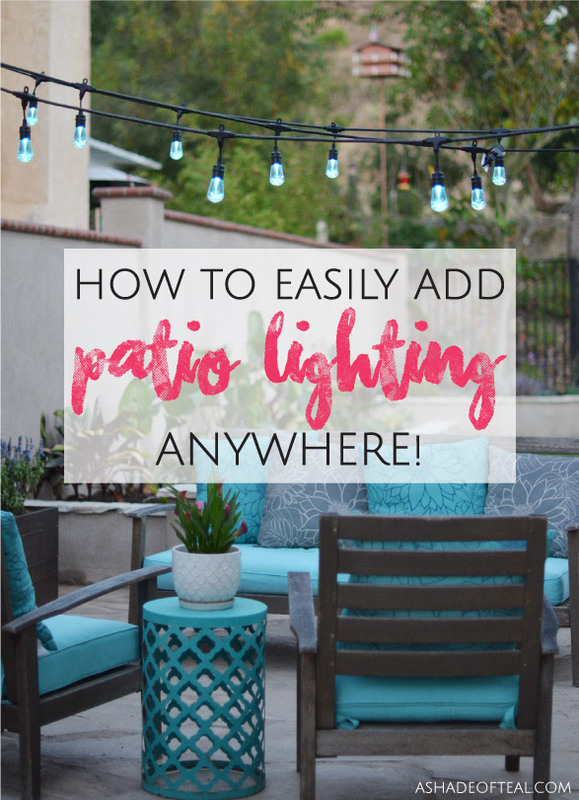 These are great tips for lighting for the patio. Thanks for sharing the tips.